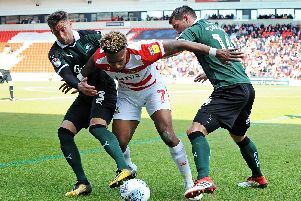 Doncaster Rovers boss Darren Ferguson has bemoaned the club’s bad fortune with injuries. The Scot is keen not to use injuries as an excuse. But the sheer number of them - and length of them - is a clear mitigating factor in what at best will be a mid-table finish for Rovers this season. “We’ve had 40 injuries this season,” said Ferguson last week. “The physio’s just told me. “I don’t know why he told me, it put me in an even worse mood [after the defeat to Rotherham]! “The problem we’re having is that they’re not one-week injuries, they’re like six weeks minimum. “Alfie Beestin’s the latest example with bad damage to his ankle ligaments. Probably six to eight weeks. He might scrape in a couple of games at the end of the season. It’s a real blow because the boy’s in good form. “We have to just get on with it. The good thing is that we’re getting players back as well. “[Andy] Butler should be back for next Saturday [against Southend]. [Joe] Wright’s back. [Mathieu] Baudry’s back. [Andy] Williams is back. “So I suppose that’s the consolation, we’re actually getting bodies back. “But I wouldn’t want to be a centre half at this club because you’ll just get injured! Honestly, it’s unbelievable. Ferguson insists there is nothing sinister about the casualty list - and nothing he could do differently. “They are different types of injuries,” he said. “The muscle injuries that we’ve had have been quite minimal really. “Baudry did one at Scunthorpe which, to be fair, he felt but never really reported it. That was the problem with that one. “Butler, there was nothing we could do about that at Shrewsbury. “Wright just got kicked in the ribs, Beestin was on the end of a hard tackle and Anderson collided with Marko. I think that’s just been the way it’s gone. “But it’s certainly annoying and frustrating that we’re getting so many injuries. “And it’s been like that not just this season but last season as well. “We’re having a really unlucky spell. “These two years have been as bad as I can remember in terms of the length of the injuries. You accept injuries, but there have so many for so long. “Like [Danny] Andrew, he played the first month. [Alex] Kiwomya, first game back in January, Feburuary time. [Luke] McCullough, not played really until now.